The busier the neighbourhood, the bigger the brain—at least for pumpkinseed sunfish, according to a pioneering study by University of Guelph biologists. Brains of sunfish living in more complex shoreline habitats are larger than those of their counterparts in simpler open water, according to the study published recently in Proceedings of the Royal Society B. This is the first known study to connect habitat with varying brain size in a single lake fish population, said lead author Ph.D. student Caleb Axelrod, adding that the finding may provide clues about how fish and other creatures will respond to mounting environmental stressors from pollution to climate change. 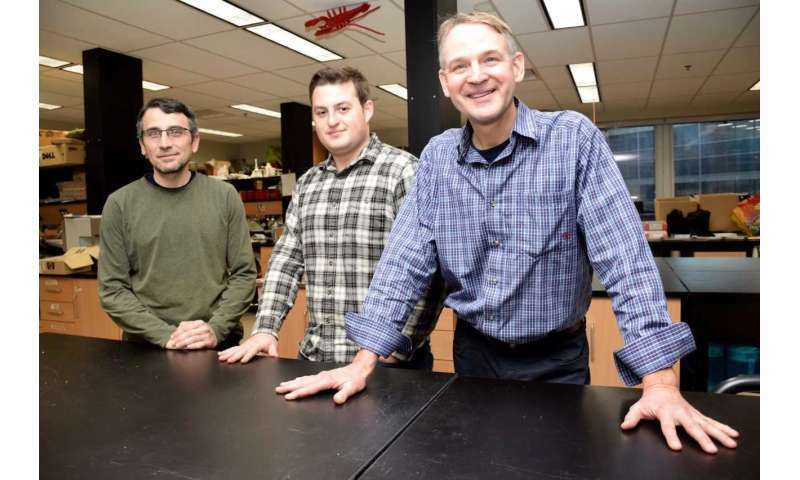 He authored the paper with integrative biology professors Frédéric Laberge and Beren Robinson. For ecologists, brain size matters. Scientists believe a bigger brain contains more neurons, and more connections among them, that lend its owner cognitive and behavioural smarts that may help it adapt to new environments. Because neural tissue burns a lot of energy, bigger brains need to offer some advantage. For sunfish, more brainpower appears to help inshore dwellers to negotiate their busier habitat, according to the new paper. Working in Ashby Lake southeast of Ontario's Algonquin Park, the researchers studied sunfish living in inshore, or littoral, habitat, where the fish forage for snails and larvae among vegetation. They compared those inshore dwellers with sunfish living in open water that typically cluster around rock formations and wait for zooplankton to drift within reach. Brains of sunfish in the spatially complex littoral zone were 8.3 per cent bigger on average than those of fish from the open waters, or the pelagic zone. "Habitat indeed has an effect," said Axelrod. Pelagic fish could have smaller brains because they're in poorer overall condition or have smaller heads, but the researchers say the fish all appeared equally healthy with similar head sizes. The team found no difference in the size of various brain regions between groups of fish. "That was a surprising finding," said Axelrod. Other scientists, for instance, have found bottom-feeding sharks have more developed olfactory bulbs than open water species whose larger cerebellum regions probably reflect different foraging behaviours. The inshore sunfish simply had bigger brains, he said: "Overall it's just better cognition." Axelrod said the study may help biologists predict how creatures will adapt to environmental stress caused by pollution, habitat disturbance, climate change or invasive species. "Maybe the littoral fish will be able to respond better than the pelagic because they already have more cognitive capacity." Robinson said the study underlines the importance of considering both behaviour and cognition in management and conservation of fish and other animals. "This study gives us a little more information about the 'black box' that behaviour comes out of," he said. In experiments on campus, the U of G team has tested how pelagic fish thrive in littoral habitats and vice versa. Axelrod said it's too early to draw any conclusions that might link performance with brain size. In adult humans, brain size varies much less and is likely less important than neuronal wiring—although Axelrod allows that there may be a kind of intuitive connection between "habitat" and performance in humans.